Lars von Trier is known as many things—a provocateur, a misanthrope, a moralist, a scold, a gimmick-meister. And based on a body of work that includes Breaking The Waves, Dogville, Dancer In The Dark, Manderlay, The Idiots, and other controversial films, he's certainly earned all those labels many times over. But I've always seen him, first and foremost, as a prankster, the sort of kid who must have spent his grade-school years planting buzzers on seats and hawking spitballs from the back of the class. Often when you see him onscreen—like in the closing credits of The Kingdom, or in his playful experimental documentary The Five Obstructions—he's got a sly grin on his face, like he's delighted to be the one pulling the strings on some elaborate cosmic joke. He's a master manipulator, which is central to why so many people resent him, but at times, even detractors should recognize how skillfully von Trier can orchestrate a narrative. The Kingdom is one of those times, mainly because von Trier is having fun rather than servicing some high-toned polemic. That doesn't mean he has nothing on his mind—quite the contrary, as I'll get to in a bit—but the miniseries may be the most purely entertaining and frivolous undertaking of his career, a delirious genre-jumping fusion of soap opera, horror, and farce, with a dash of social commentary thrown in for good measure. 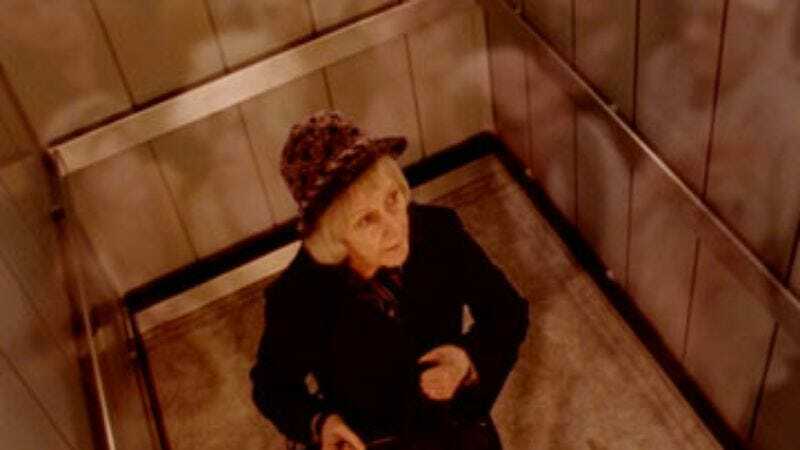 Owing debts to work as wide-ranging as David Lynch's Twin Peaks, La Cage Aux Folles, and the florid tradition of daytime television, the series purées a seemingly incompatible mix of tones into a cohesive, witty, persistently creepy whole. And like the Lynch series, it significantly expanded the boundaries of what television could accomplish. Shooting in the unadorned sepia-tone left over from his 1984 noir Elements Of Crime, von Trier and his co-director, Morten Arnfred, set up a direct conflict between the rational world of modern science and the world of the supernatural. The prologue establishes "The Kingdom" as a sprawling state-of-the-art hospital built on ancient marshlands, where bleachers once toiled over cloth in a permanent steamy fog. Building the hospital on these haunted grounds (shades of The Shining) arrogantly asserted that "ignorance and superstition were never to shake the bastions of science again." But alas, the gateway between the human world and the spirit world is opening, and those snobs who deny the supernatural are the ones it's most likely to swallow. A surgeon with no respect for his fellow physicians, much less the whiny patients under his care, Helmer faces two serious interrelated problems: His touchy-feely boss has instituted a policy called "Operation Morning Air," which is designed to improve transparency and communication in the hospital. (The campaign is promoted by stickers of the sun giving the "thumbs-up" sign.) This is bad news for a guy who prefers to dictate from his ivory tower, but it gets worse when Helmer is faced with a malpractice suit over a botched operation that left a young girl in a vegetative state. Taken out of context, the Helmer subplot could fit into any ER/House/St. Elsewhere hospital show, where in-house politics, doctor-patient relationships, and personal melodrama is par for the course. But the context in The Kingdom is seriously nutso. Consider the following developments: a medical student who expresses his love for an older nurse by sending her the head of a cadaver that resembles him; a professor whose crazed ambition leads him to order an operation to replace his own healthy liver with a diseased liver that might advance his research; a bizarre Masons-like club of hospital power-brokers that holds secret bacchanals; a phantom ambulance that pulls up to the emergency-room doors every night, then disappears; and a pair of dishwashers with Down Syndrome who act as a kind of all-knowing Greek chorus. Central to the madness is the show's lone unambiguous hero, the elderly Mrs. Drusse (Kirsten Rolffes), who keeps checking herself into the hospital under made-up symptoms in order to crack an old mystery. It seems that a little girl who died in 1919 is still wandering the halls, and it's up to Mrs. Drusse to figure out how to bring peace to this restless soul. But in doing so, she risks prying open the doors to supernatural mayhem. I won't spoil all the surprises of The Kingdom here, except to warn faint-hearted newcomers that they'll experience Udo Kier as they've never seen him before. As much as I admire von Trier's uptick in ambition over the last decade, it's a shame that his strict Dogme aesthetic has steered him away from zany genre indulgences like this one, which play to his considerable talent for rambunctious entertainment. (Perhaps his next effort, a cabin-in-the-woods horror film called Antichrist, will bring him back.) Before he was hamstrung by his own manifesto, von Trier had an arsenal of cinematic tricks at his disposal (see also: Zentropa) and he wasn't shy about using them. With The Kingdom, he gave his inner prankster full run of the asylum.